The difference between helping and selling is just two letters. But those two letters are critically important to the success of business today. Youtility is marketing so useful, people would pay for it. It's a new marketing model for the age of information overload. Due to enormous shifts in technology and consumer behavior, customers want a new approach that cuts through the clutter: marketing that is truly, inherently useful. Smart real estate professionals are applying the concepts of Youtility, giving away information and resources for free, to differentiate and dominate by providing real value to clients and prospective clients. Meticulously researched, and filled with examples of accountants and accounting firms that have accelerated their business enormously by embracing the principle of Youtility marketing, this special ebook from best selling authors Jay Baer and Darren Root provides a groundbreaking plan for using information and helpfulness to transform the relationship between companies and customers. “Would you take your foot off the ‘sell’ pedal and instead take the route of giving help and advice to a consumer when there’s a chance they will go and buy from another brand? 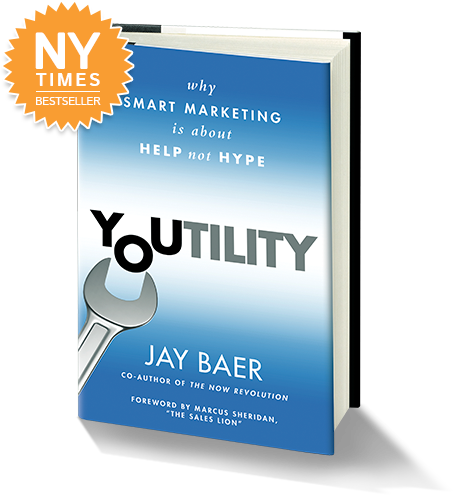 The audiobook version of Youtility (read by Jay Baer and Marcus Sheridan) gets RAVE reviews. Find out why with this sample, then purchase the audio version on Amazon (via Audible). 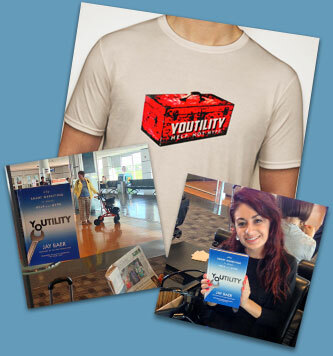 Win an exclusive Youtility Shirt. Suitable for wearing. Or framing. Or using to swaddle infants. It's useful! Just take a photo of your copy of Youtility “in the wild” and upload to Instagram or Twitter with the hashtag #Youtility. The best photo each week will win a very special, limited-edition shirt. Get your camera phones ready! Jay and his team also provide Youtility consulting for companies looking to put the principles of useful marketing into practice. For more information on consulting, please visit ConvinceAndConvert.com. Are you a company that’s using truly, inherently useful information to market your business? Or do you know of other companies that are using Youtility? Let me know at jay@boun.cr and we might include them on the blog, or future editions of the book. Jay Baer is a best-selling author, keynote speaker, marketing consultant, and digital pioneer. He's a tequila-loving, hype-free strategist who has advised more than 700 brands on their marketing strategy since 1994, including 31 of the FORTUNE 500. He got his start online long ago, before Yahoo! (and even graphical browsers) existed, leaving a career in politics to take the Internet plunge. His company, Convince & Convert helps companies craft and implement social media and content strategies, with an emphasis on truly useful information…Youtility. Jay's first book on social business, and social media's impact on corporate culture (co-authored with Amber Naslund) was The NOW Revolution: 7 Shifts to Make Your Business Faster, Smarter and More Social (Wiley, 2011). He is also the host of the popular weekly podcast, Social Pros, and has been featured by the Associated Press, CBC, Forbes, Fast Company, USA Today, NPR and many other publications and outlets.